When I was starting to publish my own works, I did a “practice” book that I had full intentions of selling to the public starting 2014. However, I didn’t quite have a good act together and it currently floats in and out of development. I do plan to finish it someday, as small a project it is. It was also a bit of a testbed on how to collaborate with other artists. This book features the talent of Beata Klisowska and Zi Chen, both who I met on deviantART in the job boards at the time. Story is simple. 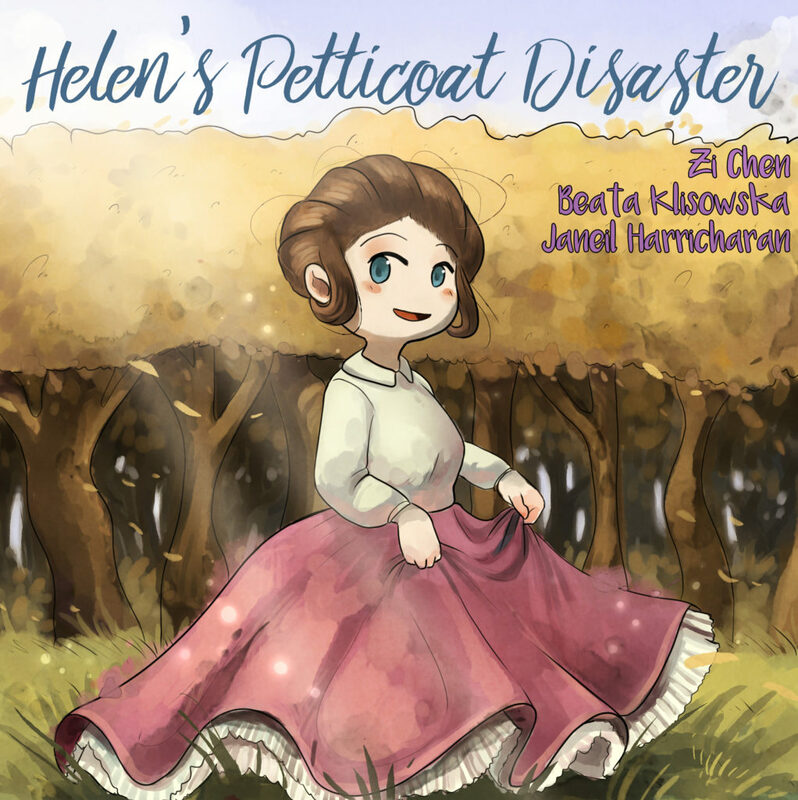 Based on some jokes from some people on the deviantART platform, this story follows the fictional character Helen, who buys into the craze of fashion and purchases a large and unwieldy crinoline petticoat. However, she find out that her new acquisition isn’t practical at times, and learns there’s a time and place for everything. This is a light-hearted story conveyed by just pictures (that’s right, no words at all!). It’s mostly aimed at teenagers and adults from the devianART community, though others may find it interesting! This book will be distributed online via various distribution outlets. All the linework and story is done, and about half the illustrations are colored. As soon as coloring is complete, formatting and distribution won’t take long. There is no set release for this book, though I estimate it may be Q2 in 2019.